Last week in our fish fry tour, we visited All Saints in Kenwood. I had heard a rumor that they offered fish tacos...which was something we have yet to see on this fish fry tour, so we were very interested in giving it a try! Their organization was very impressive. Ok, now onto the food. I ordered the fish tacos...because it's the reason I was here! Huge tacos with crispy fish, lots of cheese, some cilantro, two sides of salsa, cole slaw and some tortilla chips. Such a fun spin on the traditional church fish fry! The tacos were good and it was fun to have something different! The sweet potato fries were very very cold (this is the price you pay for efficiency sometimes I suppose) and sprinkled in like a cinnamon sugar mixture? I was not a big fan of that. I didn't taste this mac and cheese but Rob said it was nice and creamy and he was a fan...but again, not very warm. Here is a shot of Hannah's dinner. She gave it one big sign for "more"
As usual they had cute kids selling lots of cute treats. We had some cookies and chocolate covered pretzels for dessert. Overall here are my thoughts on All Saints. They score very high for efficiency and creativity...The fish scores a little lower because of the temperature it was served at and the amount of batter on the fish....it was very thick. Overall though, a great fish fry! I mean come on, FISH TACOS! I have had such an issue in the past with bringing lunches to work. Like most people, in my past I went through the lean cuisine every day phase (barf), the turkey sandwich phase and the going out to eat every day phase. None of these were particularly enjoyable whether it was to my taste buds, my waistline or my pocketbook....but it wasn't until I really started reading about and paying attention to the ingredients I'm putting in my body that I finally said enough is enough. I place such care into choosing what my family eats at home...but at work I was wasn't making the best choices....when I'm hungry, homemade chips warm out of the fryer in our work cafeteria are almost too tempting! I started really thinking about what I wanted to eat for lunch every day and decided that I needed something to motivate me to keep it up every day. That's what I started researching bento lunch boxes. Some of my favorite bloggers were constantly posting pictures of their kids' lunches everyday filled with neat and tidy little containers of fruits and vegetables and creative main dishes.I decided to google bento box lunch ideas for adults was almost overwhelmed by the amount of creative things people were packing for lunch! I sent my husband a picture of this PlanetBox and told him I was going to order two. He told me I was insane to spend $150 for two lunchboxes and that I should find something cheaper...so after a little more searching around I settled on a Laptop Lunch Box . And inside a bunch of small containers to pack up with whatever your little heart desires. It's fun because it really makes you think about the food groups when you're packing. For me at least it encourages me to get a good variety of food packed. The lunch above is chicken salad. We bought a rotisserie chicken and froze half of the meat and cut up the other half along with some celery, mayo, mustard, onions and relish to make a quick easy chicken salad. Carrots with a small amount of dip (hummus or ranch) and some butternut squash soup were added and a clementine on the side for some fruit action rounded out lunch! So much more fun to see and eat than a sandwich and chips! Last week I made a double batch of quinoa with roasted veggies in peanut sauce for the "main course"
You can find some really creative mamas out there making some crazy creative lunches, but for now these more boring bentos are working out just great! Anyone else bento'ing these days? Have any great ideas for me? if you can't get there at 5:30 and have to wait in the line....it's still worth it. There is a reason the line is long... the food is great! Hand Breaded Haddock with coleslaw and your choice of two sides for $8. The fish was the real star here....none was the same shape or size and it fell apart when they scooped it out of the containers because it was that flaky. I chose french fries and mac and cheese...which was good. They also had sweet potato fries which was a fun change! Their coleslaw had a good ratio of mayo to cabbage and wasn't too runny like it unfortunately was last week. The drinks were also a big step up and craft beer was available for only $3! Unfortunately they didn't replenish their craft beer selection from the week before so it ran out pretty fast, but at the beginning of the night they had choices from Mad Tree, Jackie O's & Dogfish Head... along with various draft and bottled domestic beers. So far Nativity is the clear front runner for their quality of food, temperature of food and selection of beer. If I wasn't dedicated to sampling all that this city has to offer this year, I would probably just come back here for the rest of lent...but alas, someone has to taste that fish! Where should we go this week?? See the rest of our fish fry reviews here! Welcome to the Lenten Fish Fry Series! 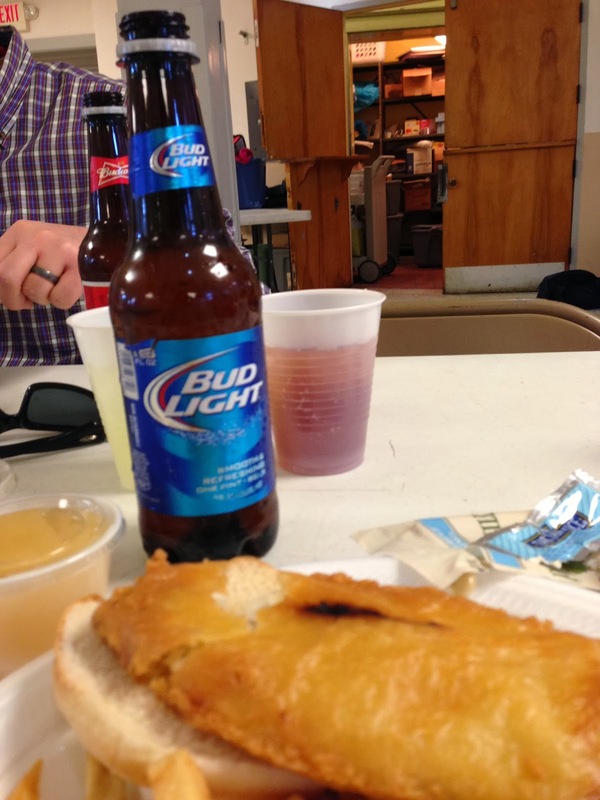 We are going to try to visit a different church's fish fry every Friday of Lent and give you an idea of what to expect. I am not going to "critique" them too harshly obviously ....because come on, it's a church fish fry and all of them are worth a visit and your support! But I always find myself wondering how they differ from each other in menu options, etc so I am here to help you with that! This week I have unfortunately been very sick all week and so even though our plan was to start somewhere different, we decided to hang close to home and start with St. Cecilia in Oakley. 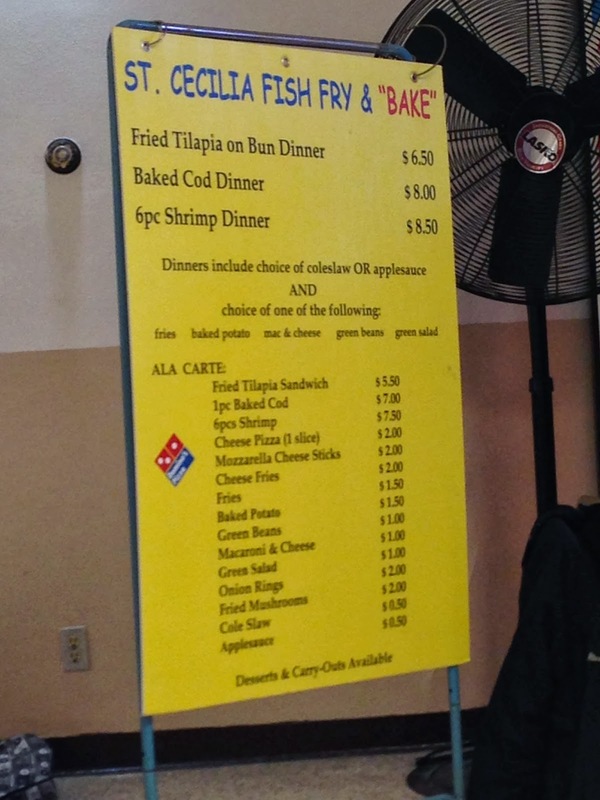 So basically for $6.50, you get fried tilapia on a bun with your choice of applesauce or coleslaw, plus a choice of the following: fries, baked potato, mac & cheese, green beans or green salad..
Then there are lots of extras you can add on like mozzarella cheese sticks, fried mushrooms, cheese fries, etc. At this fry they also have the choice of baked fish or shrimp...but to me that is not fish fry food....Fridays during lent are pretty much the only times of the year that I eat fried fish...so fried fish is what I want. Also, Rob ordered the baked cod the first time he ever went to a fish fry (he is not a native Cincinnatian) and basically jealously eyed my dinner until I finally offered to share it with him...so I don't think he'll make that mistake again either :) There was also a kids meal that was your choice of fish or cheese pizza. Anyway, Rob and I both went for the fried tilapia dinner with french fries. We got one cole slaw and one applesauce..and I added a little side salad for $1. It was a nice big piece of talapia served open face on a white or wheat bun with a nice big side of salty fries. It was all pretty cold, especially the french fries, even though we ate in. St. Cecilia....a solid place for a good fish sandwich and some fries. Reasonable prices. Friendly patrons. Last Saturday was the kind of day that gives you the nudge to just hold on a little longer until spring because spring...is awesome. It was warm enough for jeans and a long sleeve shirt in the sun and maybe a light jacket in the shade. It was a day begging to go down to Findlay Market..
Oh Findlay Market hello....how I have missed you. We chatted with some farmers, got some lunch and sat on a stoop and enjoyed it in the sunshine. After lunch we decided it was the perfect time to (finally) check out Rhinegeist Brewery. We are big fans of their beer and had heard that the space was really neat. It was WAY bigger than I had imagined in my head and was full of fun things to do! Love their food "menu" Pretzels $3 or the phone number for a local pizza place. It would be fun to bring in a picnic from Findlay too!